The U.S. Navy has awarded Harris Corporation a two-year, $29 million full-rate production contract to provide key avionics components that will enhance flight crews' targeting capabilities on the U.S. Navy's and Australia's F/A-18 E/F Super Hornet fighter aircraft and EA-18G Growler electronic attack platform. The avionics are a critical part of the Distributed Targeting System which will significantly improve the aircraft's networking capabilities, enhance targeting precision and shorten the time from target sensing to shooting. 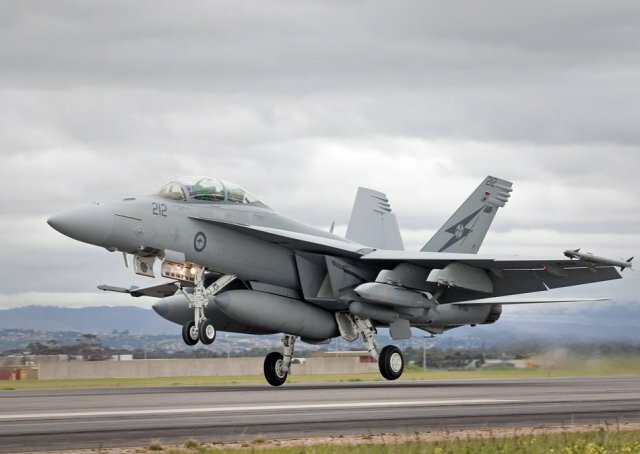 "The F/A-18 brings critical Navy fighter and electronic warfare capabilities for the U.S. and key allies such as Australia," said Ed Zoiss, president, Electronic Systems, Harris Corporation. "Upgrading the mission- and image-processing prowess of the platform will help ensure that it continues to be the primary fighter aircraft for the U.S. Navy." The combat-proven Super Hornet provides unequaled air dominance and precision strike capability. The EA-18G Growler, derived from the Super Hornet, is the U.S.' newest and most advanced airborne electronic attack platform. The Super Hornet and Growler programs support 60,000 jobs in the U.S. across 800 suppliers in 44 states, accounting for $3 billion in annual economic impact. Two squadrons of the Royal Australian Air Force are currently flying on the Super Hornet, for a total of 24 F/A-18E/F fighter aircraft. The US Navy maintains in service at least 319 F/A-18E/F and 103 EA-18G Growler electronic attack aircraft.